And what if you have tried everything already, and nothing seems to work? 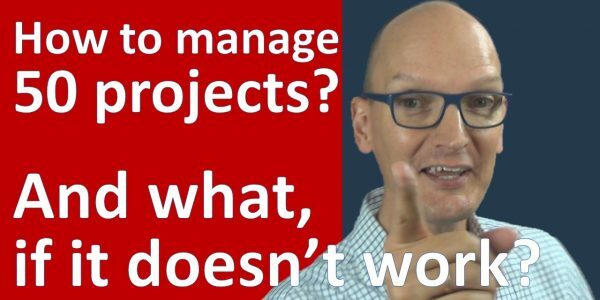 Managing many projects is one of the biggest challenges for organizations. Most organizations have improvement strategies, task forces and action plans to get in control. But most initiatives die a silent death, without getting in control again. The key insight is that more than 94% of problems are caused, by people who don’t have enough time. Did you know that? This is about people who can’t live up to their commitments. Who make more errors. Who communicate less. They don’t have the time. They have other things to do. Because projects get started regardless they have enough time or not. The core question to answer when starting a new project is – Do we have time right now for this project? When do we have capacity? In this blog you learn a robust and proven strategy to prevent the pipeline of project gets jammed, or runs empty. There are solutions for this. Like Resource Leveling. The principle is simple. Delay projects and tasks till the overload is gone and nobody has a workload that exceeds 100%. The problem with resource leveling is, it doesn’t work in practice. It requires a lot of detailed and accurate data, which is not available. It doesn’t cope with the high levels of uncertainty, that projects are known for. It doesn’t work when multi-tasking is a widespread habit. It creates massive overcapacity, to eliminate a workload higher than 100%. The key insight is that the resource load, as presented in resource load graphs, doesn’t exist in reality. So why bother to prevent that the workload exceeds 100%. Drum-Buffer-Rope is a known and proven tool from the Theory of Constraints tool box, to manage the workflow in organizations. To take care that everybody has enough time to get their work done. It is widely used in production and service organizations. And for transport and distribution. Critical Chain Project Management is the application of Theory of Constraints for project management. Together with Agile it is the most important contribution to project management of over the past 25 years. Critical Chain Project Management uses the term Staggering to stack projects in a pipeline. The designated tool to support Staggering is Resource Leveling. To make a long story short, I got frustrated in my attempts to implement it. Till I realized it, is not me to blame, but Resource Leveling. That is how I rediscovered the beaty of Drum-Buffer-Rope. Projects will only be added to the pipeline when other projects get completed and removed from the pipeline. This is referred to as the Drum. There is some work waiting to be picked up to absorb fluctuations, changes and uncertainties. This is the Buffer. Given the position of the Drum in the Pipeline, the start of the project is determined by the lead-times in the project. This is the Rope. The beauty of Drum-Buffer-Rope is that is maximizes the utilization in the organization, while it still guarantees that people have enough time to their work done. It eliminates the rootcause of 94% of the problems with projecgs. This video details how Drum-Buffer-Rope works in project organizations. It is based on an actual implementation for an engineering organization. I hope you like it, you can subscribe now for a free training. I share secrets about projects, nobody ever told you before.